A call from a local GP last week – 53 year old woman who was given a course of oral amoxycillin+clavulanate for respiratory infection and then developed moderately severe enteritis associated with CT evidence of colitis. Stool testing for C. difficile toxin genes was positive, confirming a diagnosis of CDI. She responded to a 10 day course of oral metronidazole and then relapsed within 1 week of stopping with diarrhoea. She has no underlying medical conditions and has not been admitted to hospital in the past year. 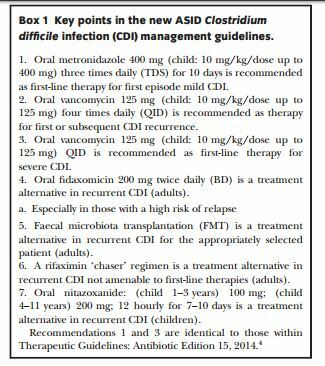 For the latest management advice, we would suggest you consult the 2016 Australasian Society of Infectious Diseases updated guidelines for the management of Clostridium difficile infection in adults and children in Australia and New Zealand. Key points indicate that oral vancomycin is the best second line treatment approach for relapse or for severe infection. Oral vancomycin is expensive when prescribed privately and it is recommended that discussion with Infectious Diseases occurs so that a public hospital script can be arranged. What about our local (Hunter New England Local Health District) data on CDI? There were 259 hospital diagnosed cases of CDI in 2015 (this means cases detected within a public hospital setting – includes patients presenting to ED and excludes repeat positives within 8 weeks and positives in patients aged under 2 years). The McDonald classification is accepted internationally as the best definition of healthcare-association for CDI. 65% of 2015 cases were definitely healthcare- associated (McDonald classes A or B). This left at least 30% as community associated (see breakdown). Healthcare-associated rates of CDI per 10,000 occupied bed-days for 2015 varied between 1.8 and 3.0 across 6 major HNE hospital sites, with one outlier hospital running at 6.2/10,000. When test utilisation figures for 2015 were examined, that hospital tests on average twice the number of patients for CDI which may provide some explanation. The reported Australian HCA CDI rate for 2012 was 4.0/10000 bed-days 2012 (MJA 2014: 200:272-6). An important change recommended in the ASID guideline is for laboratories to start a process of testing for CDI on any loose stool submitted from a patient who has been an inpatient for more than 72 hrs. This has the potential to increase measured HCA rates substantially. Conversely, labs are being counselled to ensure that formed or soft stools are not subjected to testing, owing to high false positive rates due to carriage. Note also that ‘test of cure’ for CDI is not recommended– faeces tests remain positive for some weeks following recovery from CDI.